Here are a few of the little numbers I was working on the past couple of weeks, courtesy of my new fave book: Kwik Sew for Baby. Despite the totally 80s pictures & illustrations, this book is a goldmine! Great info on fabrics, notions & construction for the beginner and great explanations on making variations of the many designs for more experienced sewers. Nothing is ridiculously complicated or time consuming either. 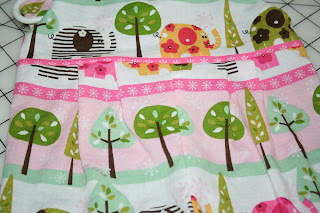 Dresses, footed sleepers, crib sheets, it's all in there. Coming with loads of patterns in sizes 0-18mos & at such a reasonable price it is well worth getting if you want to make a variety of things for little ones. 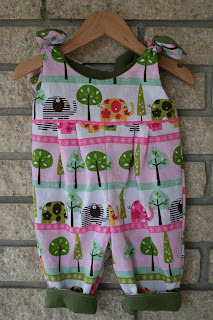 The little elephant overalls were made using the pintuck jumpsuit pattern with my own variation on the top portion using ties inspired by the Itty Bitty dress from Made by Rae. I made mine a bit longer & wider so it would fit longer. Since cute cotton prints like this are too chilly for winter, I lined the entire thing with green knit for coziness. 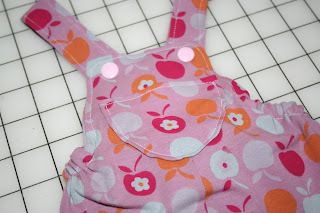 This pink apple outfit was made using the bib overall pattern and was super easy to make. 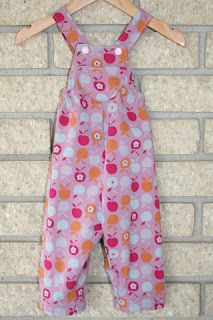 The back is elasticized so it has a more fitted look & by using a printed knit it's ideal for squirmy little ones. I used my new snap press to add a few rows of snaps for adjustability too. A good portion of my new fabric is earmarked for items from this book. I can't wait to try out the footed sleeper! These overall's are so adorable :) Love the fabric I actually have that elephant fabric I fell in love with how cute it was! Oh they are both adorable! Sewing has never been my forte. I managed a few halloween outfits for the girls and a jumper dress. I'm participating in sew something month so i hope i can get a groove going! I'm following you-if I want to start sewing again i'm going to need some expert advice. I came over this morning to comment on the backward mullet and got so engrossed in your creations I forgot! So I'm back! I just thught it was hilarious that you said the same thing my husband said about that haircut. He called it business in the back and party in the front which is the opposite of the mullet! Anyway thanks for the giggle! Both are cute. I absolutely adore the elephant one! Love it. Nice job. WHere did you get your snap machine and how much was it? I'm so impressed with your sewing ability considering you haven't been sewing long at all. Way to go!